Today I have an Optical Illusion for you and a lot of photos. 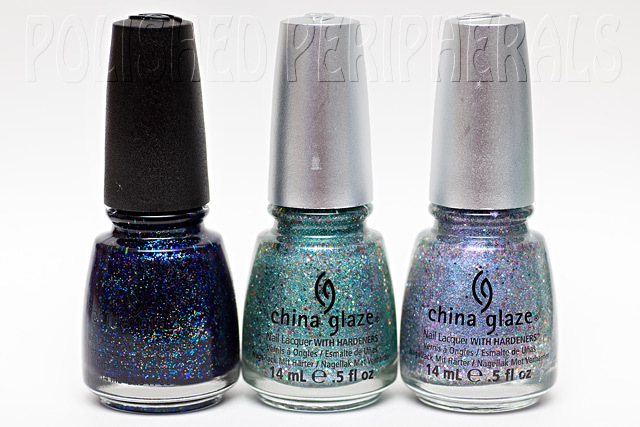 This is China Glaze Optical Illusion from the Prismatic Collection. 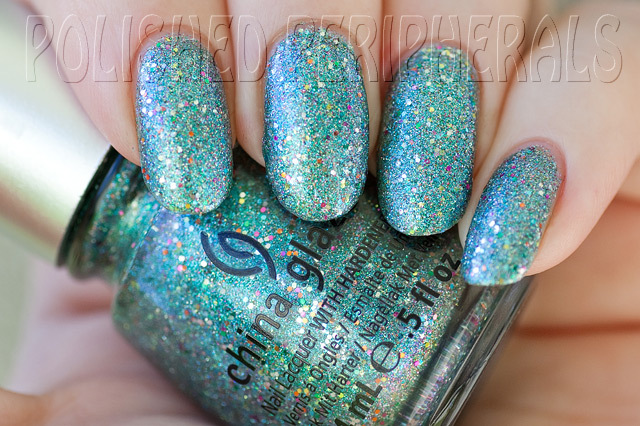 It's a silvery aqua green that's packed with glitter but it's not thick or lumpy. 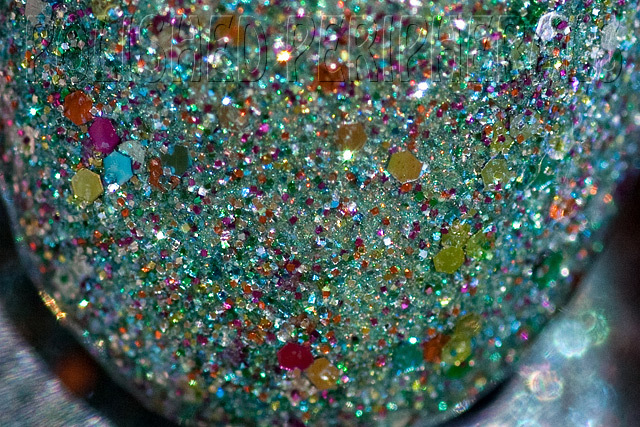 It has larger glitter scattered throughout in pink, gold, silver, orange and green, and there's a subtle duochrome effect that shows blue and purple at the right angles. I love this polish, much more than I expected to. It has such good coverage for a full glitter. It's smooth and easy to apply without any dragging or gaps. It does dry rough but that's what top coats are for. The duochrome is hard to see and harder to photograph. I took a lot of photos to try and capture the colour shift but failed. You'll just have to trust that it is visible to the naked eye. You can just see the purple colour in the edges of the bottle. I purchased Optical Illusion online from The Nail Shop. 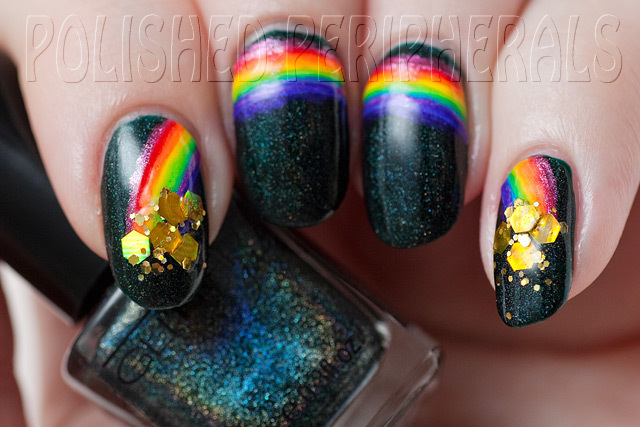 I also got Prism and I'm tempted to get more colours now. I love a full cover glitter that applies so easily and isn't thick. No sign of any chips yet and I only used a thin top coat. I thought I'd share some quick photos of my weekend haulage and today's small nail mail. I often pick up a polish or two when I'm out on the weekends and plan my shopping trips to include any polish sales or new stock but I look more than I buy. I don't often specifically head out for a mega buy like I did this weekend. This weekend I dragged the family out to the nail supply store. It was a bit of a hike but we found it easily enough and the boys were reasonably well behaved. We only had one screaming session from the 3yo (when he was told he couldn't play chasing around the aisles of polish) and they managed to avoid breaking anything so afterwards we took them to Yum Cha as a reward. I found a lot of polishes I wanted, some I bought, some I fondled and put back, some I'm planning on going back for and some I wanted but couldn't find. I got 13 China Glazes, 2 OPI, a spare bottle of Seche Vite (although I'm pretty sure Essie Good to Go is winning as my favourite), a large 473ml refill of Out The Door and a gallon of acetone. Oh and a couple of empty 15ml bottles as freebies. Then today I had 2 more China Glazes arrive. From the left we have For Audrey, Re-Fresh Mint, Secret Peri-wink-le, Sour Apple. What's with the dashes in periwinkle? Is there some hidden meaning I'm missing? and it actually says secrect on my label, I got my glasses out and checked. Pretty sure it's meant to be secret. and LOL, OMG, Kaleidoscope Him Out and He's going in Circles. My two lonely OPIs Absolutely Alice and DS Original. Considering how readily available OPIs are in Australia I really don't have many. They are just too pricey here. Just enough to swatch a full nail wheel (I did Sour Apple twice). 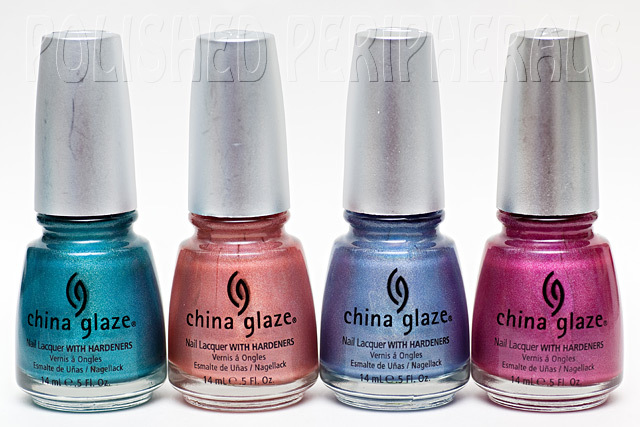 China Glaze He's going in Circles, Kaleidoscope Him Out, Sour Apple, Meteor Shower, For Audrey, Re-Fresh Mint, Secret Peri-wink-le, OPI Absolutely Alice and DS Original. China Glaze Sour Apple over Essence Lime UP! 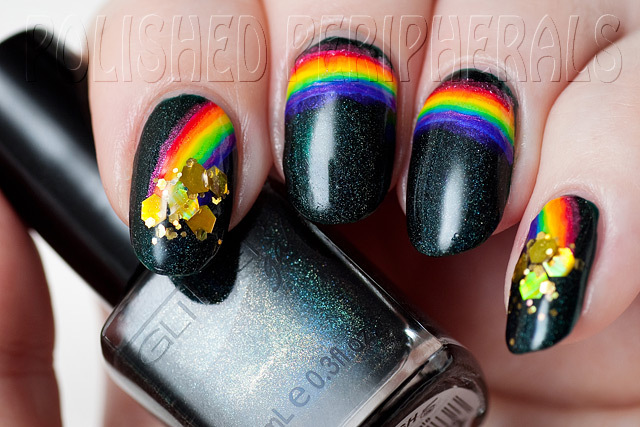 (just had to try it), Prism, Optical Illusion, OMG, 2NITE, TTYL, QT, LOL and DV8. 2 coats of each with Sally Hansen Mega Shine top coat. 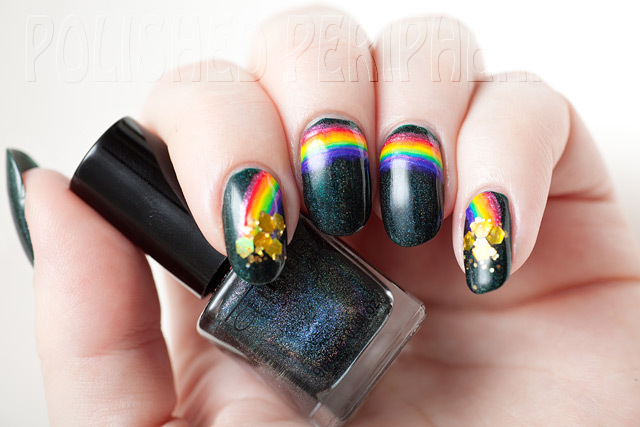 The holo in He's going in Circles and Kaleidoscope Him Out is lost when the top coat is wet but once it's dry it looks even more holo. I didn't notice any difference in the others. Now I just have to decide which to wear first :) I can already see some good underwear/layering combos. I recently got my first Nerdlacquers and I was so impressed the first thing I did was jump online and order more. 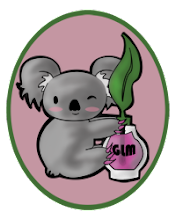 I've been lucky enough to catch the Etsy store open a few times and now have 4 bottles in my possession with 2 more parcels coming my way. 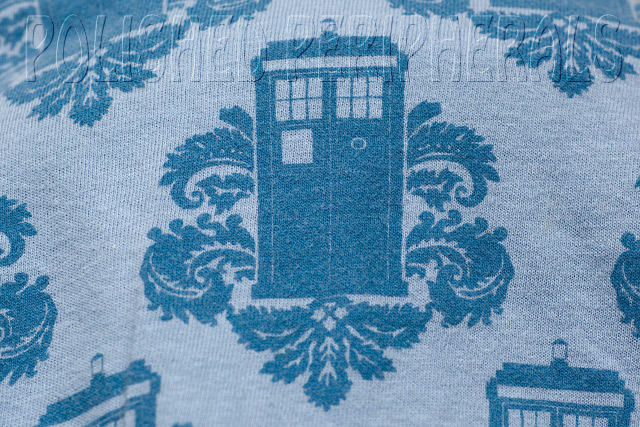 The only one I really want but haven't been able to order yet is Regeneration. If anyone has a Regeneration out there they don't want I'd be happy to buy or swap it. So this weekend was my Mom's 70th birthday and I've been wearing Nerdlacquer Holy Grail. No link really except this polish is as amazing as my Mom. Happy birthday Mom! 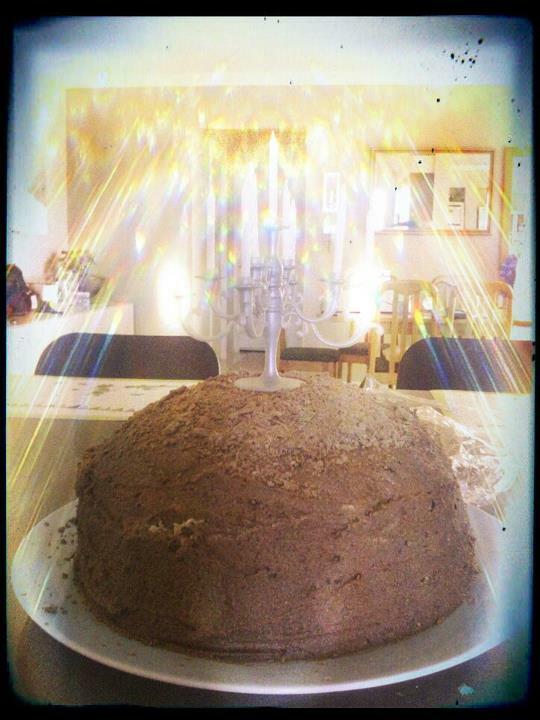 I made a big cake :) Quick photo taken with my tablet because I was so proud of myself and thought the candle holder looked cool. The cake was yummy. 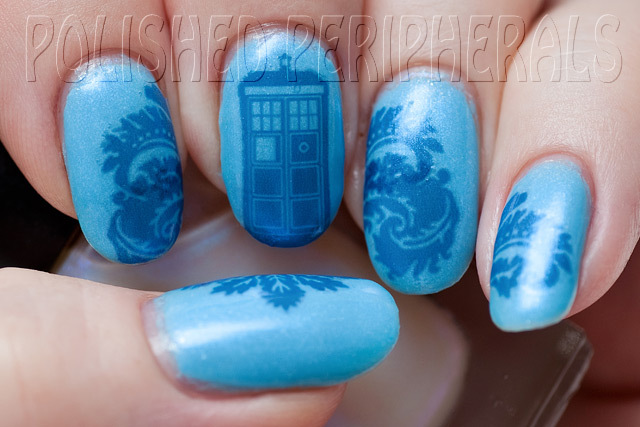 Now back to the nails. 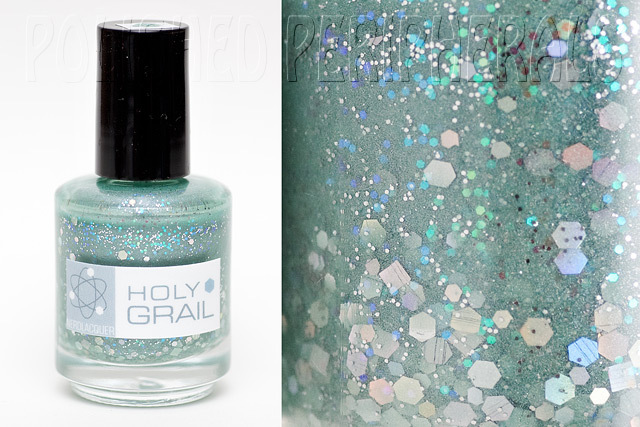 NerdLacquer Holy Grail is part of a special edition duo (I didn't get the other one). 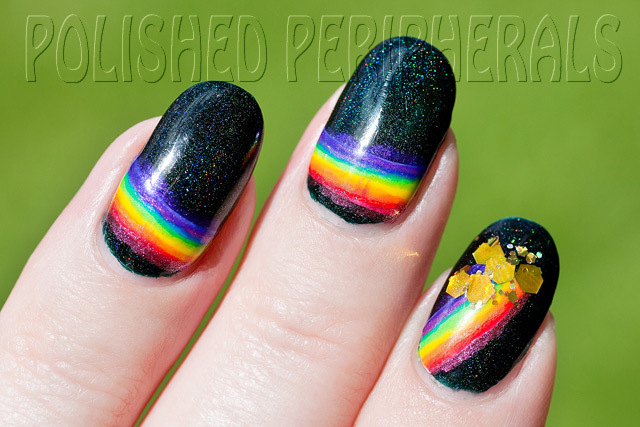 It's a glow-in-the-dark, linear holo with glitter. Yep it has a bit of everything. 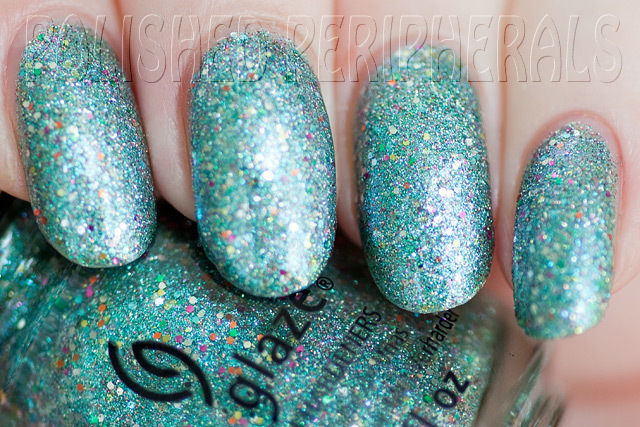 It's a soft blue-green colour that turns out different in every photo and is opaque in 2 easy coats. 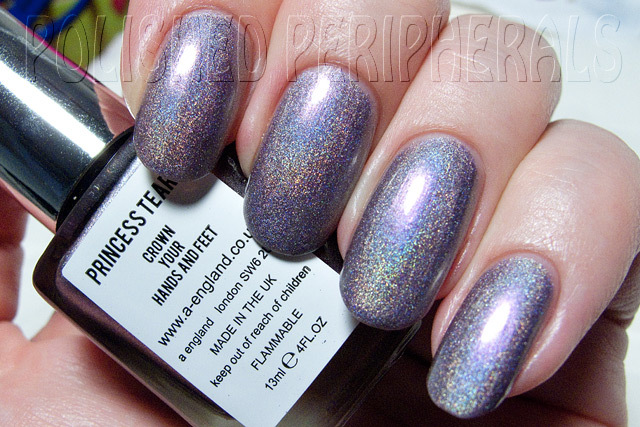 This shot in full sun shows a bit of the holo but the colour came out darker than it really is. I used a different top coat on each hand and it's smooth and shiny with Essie Good to Go on my left hand but still a bit glitter rough with Essie To Dry For on my right hand. So I recommend a thick top coat. I spent a lot of time this weekend staring at my nails trying to make up my mind whether to call this blue or green. Not that it really matters but my family think I'm blue/green colour blind so I make an extra effort to identify blues and greens correctly. Yesterday we were on the motorway and I spotted a car in front that looked like a similar colour so I made my husband catch up so I could compare it with my nails. It was a Mitsubishi Mirage, probably around a 1997 model, and pretty much a perfect colour match. Looking up the paint details it's called Neptune Green Metallic so I guess I can call this polish green :) It's also the same colour as the carpet in our old house which was called Academy Grey but let's ignore that confusing detail. 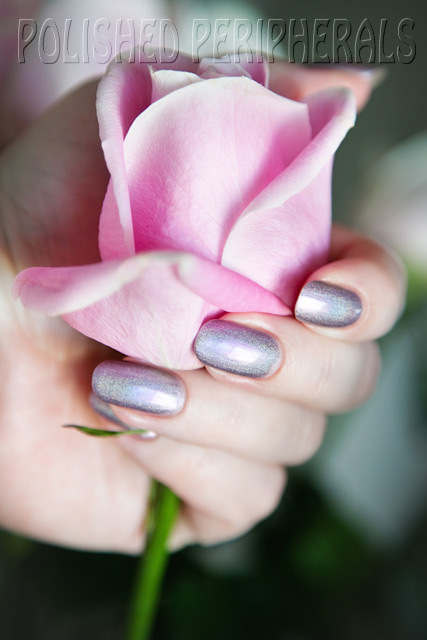 Whatever you call it, it's a beautiful soft colour with all the added eye candy of glitter, holo and glow in the dark which means it's mesmerising in any light. I am very impressed with these Nerdlacquers and recommend stalking the Etsy store http://www.etsy.com/shop/NerdLacquer to grab your own. Green is my favourite colour and I have so many green polishes I wanted to wear for St Patrick's day but couldn't decide. Then Glitter Gal Cosmetics posted on facebook that they were looking for the best green nails for St Patrick's day using any Glitter Gal green polish. I only have one of their greens so far, the famous Lizard Belly, but it was on my list of greens for the day so I was happy to whip it out for some quick nail art. 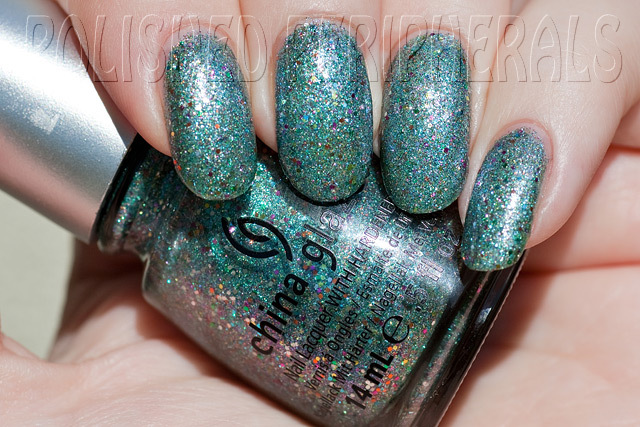 Lizard Belly is a very dark green holo, so dark it's almost black but more flattering for my skin tone than black. It's smooth, shiny and wonderfully opaque. 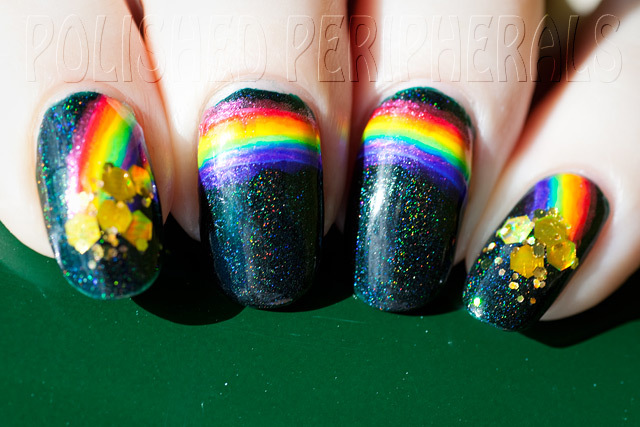 I started with 2 coats for my background then painted a lucky rainbow across my nails complete with gold coins at each end. 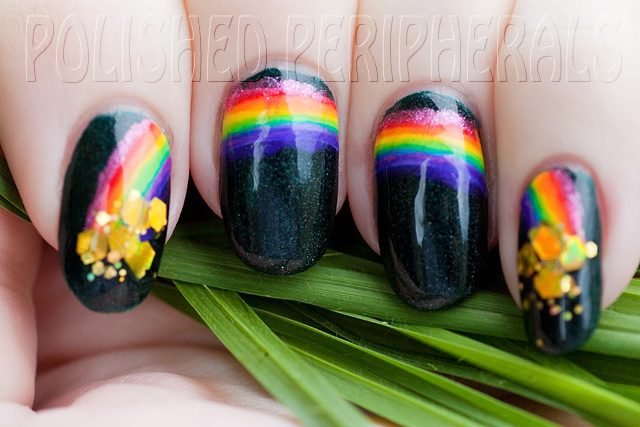 I used some 2 way nail art pen/brushes I got from ebay for the rainbow (over white) and BYS Pot of Gold for the coins. Of course it rained all day yesterday so I couldn't see the Lizard Belly holo rainbows. Today it's been raining again with occasional breaks of sun so I've been running outside with the camera each time to try and get some photos of the holo in action. See that green in the background, that's the grass. All the rain is great for the lawn. I love it when it's lush and green. I couldn't decide between a-england Princess Tears and a-england Ascalon so I decided to wear both in a half moon manicure. 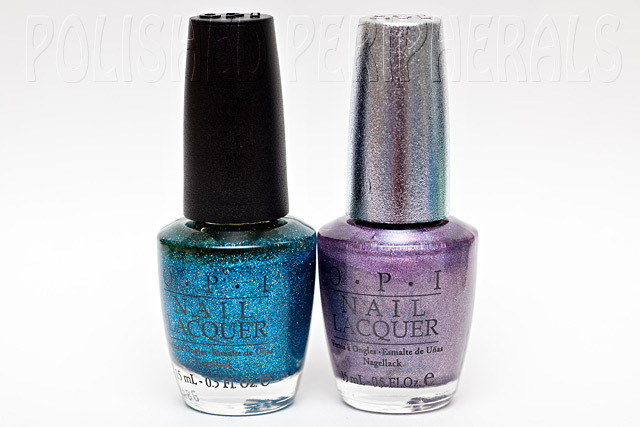 Both are amazingly beautiful holos with a mesmerizing lavender/lilac flash. How could I possibly choose between them? I started with 2 coats Princess Tears then I was so stunned by her beauty it took me 2 days to get up the courage to cover her up. Yep I spent 2 days staring at my nails under every lighting condition I could come up with (but that's not unusual for me). I really wanted to see how this would look with the darker Ascalon so I went with a simple half moon design. This is just one coat of Ascalon. Wow! 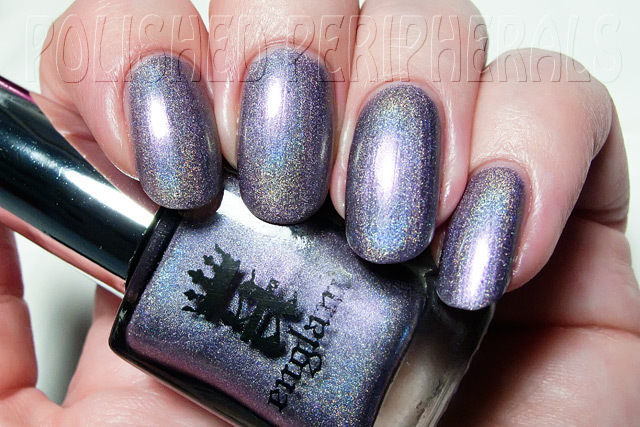 The holo was even more obvious in the darker colour and the lilac/lavender flashes of each played so well together. I wore this for a week. A week without any chipping or tip wear. 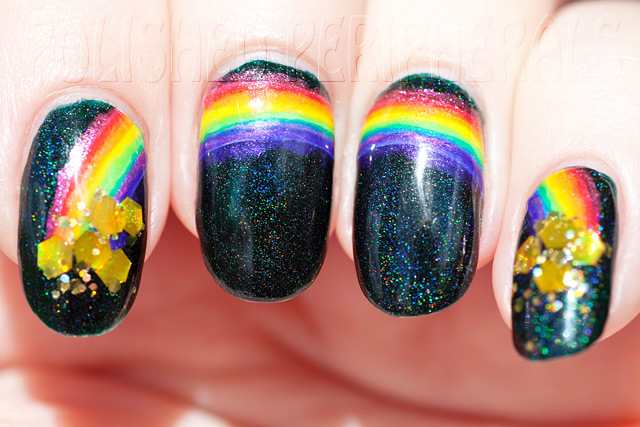 A week of staring at my nails and tilting my hands back and forth to catch the rainbows while bursts of lavender light rain down my finger tips. Does it look like my finger tips are a bit red and swollen? It's just an optical illusion. Unfortunately the pink tones of Princess Tears, and a little less so Ascalon, don't work so well with my skin tone. It looked like my finger tips were sunburned but the way my nails were flashing I don't think anyone noticed my skin. It's weird how colours can trick the eye like that. a-england polishes are amazing. Smooth, opaque and such glorious colours. If you haven't tried them yet you really should. Bet you can't stop at one :) Adina's 'united world' policy of free international shipping makes it easy to keep coming back for more.